Sew Hard is a souvenir in the game WarioWare: Twisted!. It is found in the Games section. 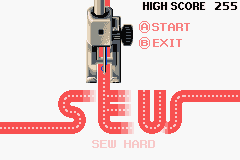 When the game starts, the player takes control of a sewing machine, and the objective is to guide this sewing machine along a long strip of cloth. If the sewing machine goes off the cloth, it blows up and the player loses. This souvenir is based on the microgame Sew Easy. This page was last edited on August 30, 2018, at 18:48.